In response to growing interest from our members for more activities, this year EBUK is organising a week-long programme of earth workshops and events around our annual conference. The theme of the conference is the culture of earth building and we want to explore how people and places reflect the experience of building with clay. So in 2015 we’re holding our Clayest! at Errol an old Scottish town built in a lost clay tradition of mudwall. It will be in June so the weather will be nice! We’re working with the Tay Landscape Partnership and the local community as part of 3-year programme of activities to explore and celebrate local earth heritage. If you come to Clayfest you will see some of these activities, including oral history, schools projects, recording, repair and training, alongside the normal events. 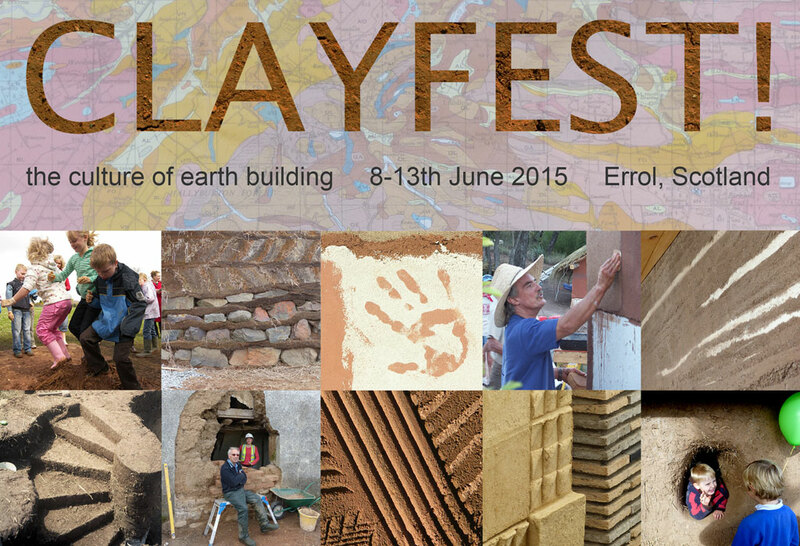 Our main focus is 4 days of workshops covering arrange of techniques including rammed earth, cob, mudwall conservation, clay plasters, turf building, and clay/fibres. The intention is that over a week you can learn about all these skills by doing a different workshops each day, or you could do a deeper delve into a particular technique. The workshops will be led by leading people in their fields and we are specially delighted that Bill and Athena Steen will be joining us from Arizona.